Gorgeous pictures of breathtaking landscapes...as usual! Thanks for introducing us to such wonderful places, especially us here in the Mediterranean. Miss all that freshness that comes from frequent rain. Leave it to Loi to find a wonderful treasure! 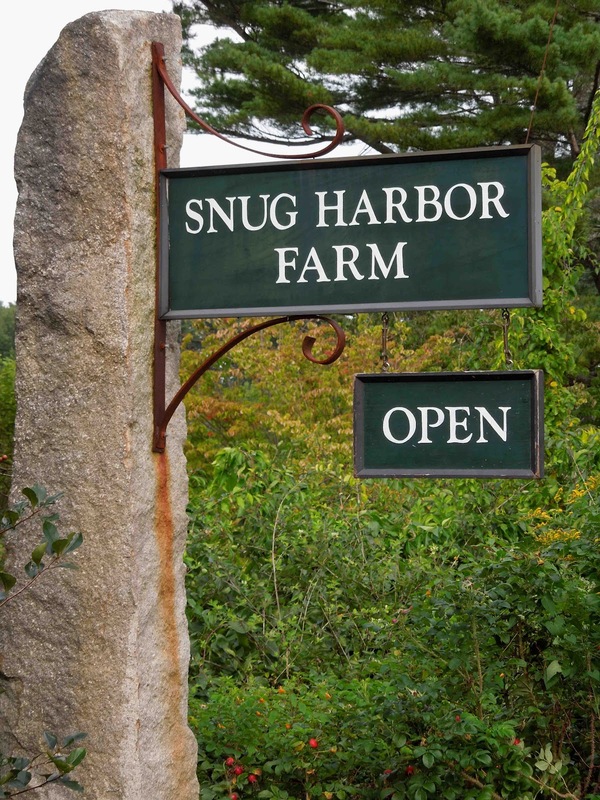 We would love to go the Snug Harbor and will add it to the list for a trip to Maine. I LOVE every shot of this post. The sunflowers dancing over the foliage is so sweet! Nurseries like these are so rare, thank you for this discovery Loi. Tricia makes beautiful things and got my vote a couple of days ago already! Wish we knew about Snug Harbor last summer. We would have loved walking through this "fantasy"!!! Thank you for sharing. I hope you all enjoy this beautiful weekend we're having! hi Loi, We were just there two days ago! Your pictures do my favortie garden shop pure justice! Isn't it an amazing place?! Did you happen to see their soaps? There is one that I've been meaning to write you about that I think you might like for your shop. As I mentioned in my last comment, we are only an hour and a half away so it's a wonderful day trip for us. We were there during a stay in Kennebunkport over the summer and loved it. We had dinner at a lovely restaurant in Cape Porpoise that evening....oh how I miss the lobsters!!!!! Thank you for taking me back there. Lucky you being able to check out their magnificent topiary. I've just looked at their web site, and can just imagine spending a happy hour there. Glad you found Snug Harbor Farm. It has been a favorite of mine for years. I love the way the way all the plants are displayed and the grounds are laid out effortlessly. I real treasure, I agree. Hi Loi, I'm crazy about that low building with the green window frames. I understand that it is part of a business, but were it mine, I would take away the benches and most of the plants in front in order to feature the architecture. The benches are very attractive, of course, but lead my eye away from the building. Do you like espaliers as well as topiary? My own garden fantasies are pretty much limited to fruit growing, but I can imagine a few espaliers, especially in a place like Maine where you might need to trap the warmth against a wall. Overall, It's hard to image a more attractive place to spend a few hours and wander around. Uh oh, Loi, I feel a road trip coming on. I have been very patient (almost two months! ), but I want some bigger topiaries now and those pots are fabulous. Gorgeous, artistic photos! 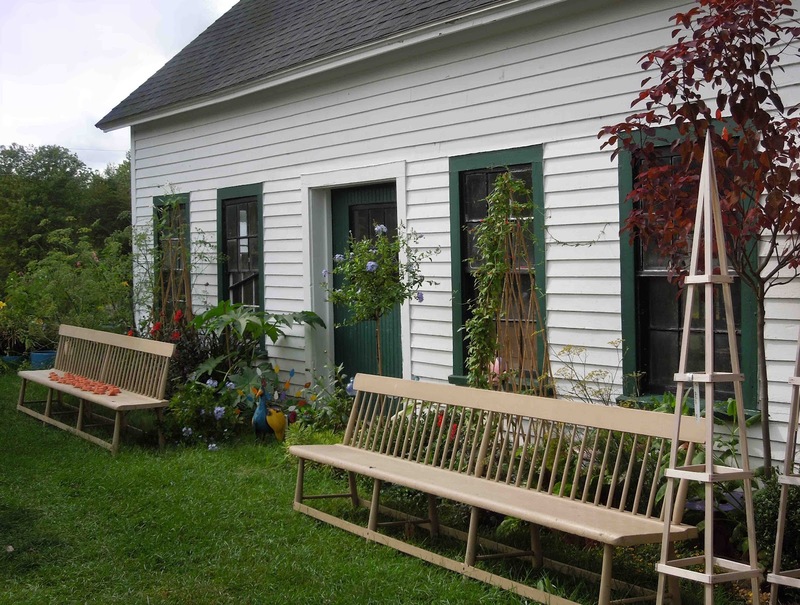 Snug Harbor farm looks an attractive place to spend some time and some money. The dovecote is a delightful building although personally I would not have doves in my garden. A house nearby to us had a dovecote, and their doves would spend the whole day on our roof. They make an awful mess and breed far too often and quickly. Luckily they all got a virus and died - hope this tale does not offend anyone. As you are a great fan of topiary, I wonder if you have visited Levens Hall in Cumbria. They have the oldest and most wonderful topiary, supposedly, in the world. I would recommend you visit if you are ever nearby on your trips to the UK. Loi - do you know what the white flower is? 4th photo from the bottom. What fun to live so close to such beauty! 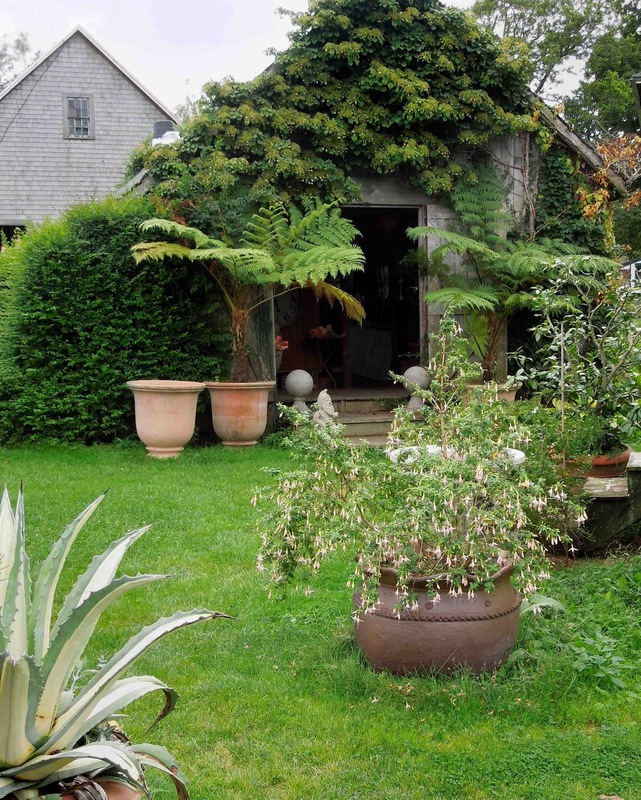 This farm is lovely and there is nothing prettier than a topiary! I'm not very good at keeping them alive, though! The grounds you've shown here are amazing! I wish it was my own backyard! Have a wonderful rest of your weekend! I will check out the other website and vote for sure! Great pics Loi, I especially liked the butterfly on the sedum( was it?). In my younger days;) ,Patick and I rode our motorcycles through that area and loved it. Riding up to the quaint inns and shops on our big bikes raised eyebrows. Patrick was just happy that I couldn't fit too much in my saddlebags...the shops were hard to resist. 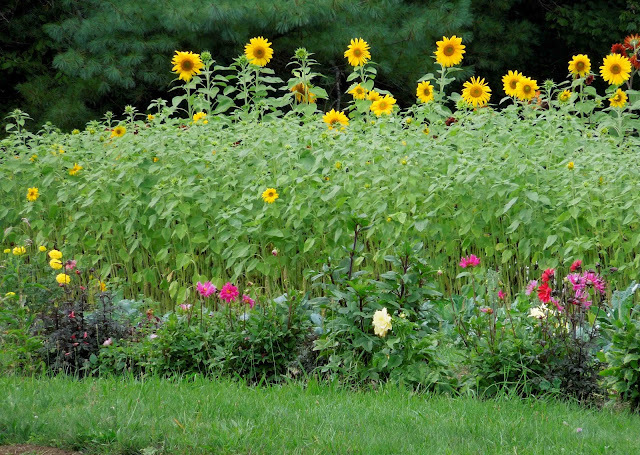 Oh, I can see you were in Gardening Heaven! I love topiary, too, and I used to go out of my way to drive by a house in St. Petersburg that had a topiary elephant! Sadly, new owners let that incredible piece of art go back to its original state, and my elephant is no more. Really beautiful photos! You really captured the essence of the place. 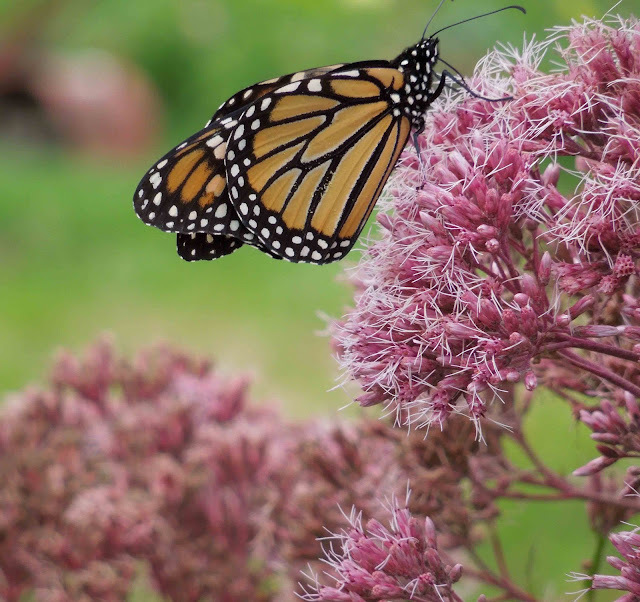 Love the photo of the monarch on the Joe Pye weed. The photo of the potting shed with the plants in the front the dovecote in the foreground is also great. I'm going to have to make a trip up in the next few weeks. I haven't been there all summer. So envious! 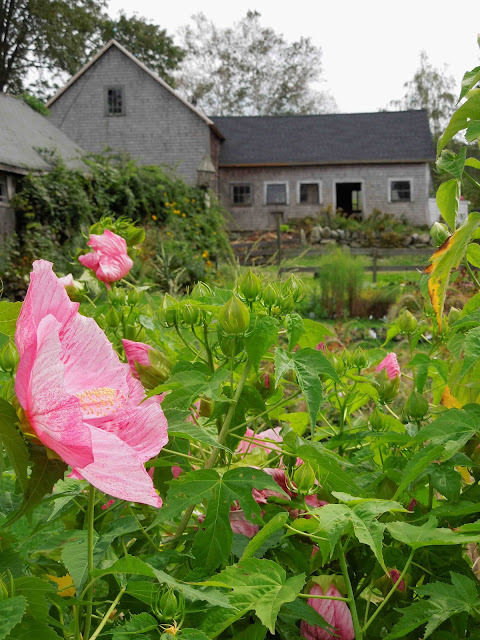 I love Maine in the summer and Snug Harbor Farm looks gorgeous. What a fun place. Only 4? That is restraint! I need and want some like your topiaries in my life! Have a lovely weekend. Lovely. I would love to illustrate any of the homes you send my way and give a try at a subtle all white palette. Your eye is so discerning. I appreciate that. 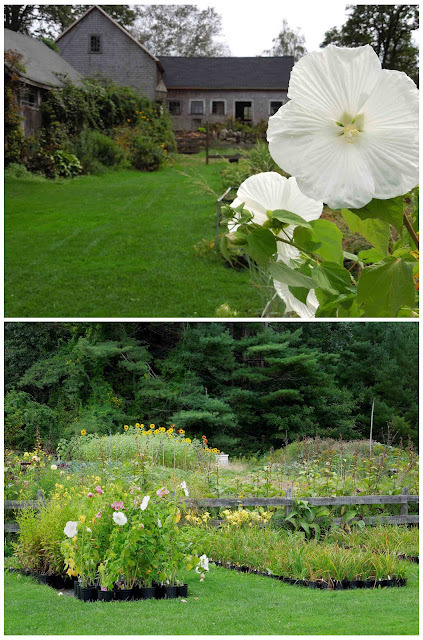 Love Maine and Snug Harbor is one of my favorite spots. This whole property has me wrapped around its little finger. Not too far to travel...perhaps next summer .Thanks for the gorgeous photos. I'm surprised you made it out of the topiary greenhouse without at least 10 purchased plants =). Those hand thrown pots are amazing. It looks like a little slice of heaven and your photographs, as usual, are amazing. It looks like such a wonderful place to visit with such healthy plants to buy. Thank you for sharing. I can well understand why you feel in love with that place, my friend! All is so calm and tidy but natural at the same... I love even that tables show! love the mora clock and your beautiful shop too! Grazie caro Loi per la bellezza che ci regali. What a perfect name for a place 'Snug Harbour' and it looks a peaceful and relaxing respite from busy life. I could just see myself in a little cottage there, do you think they could enlarge the dovecote a little, it looks so pretty. 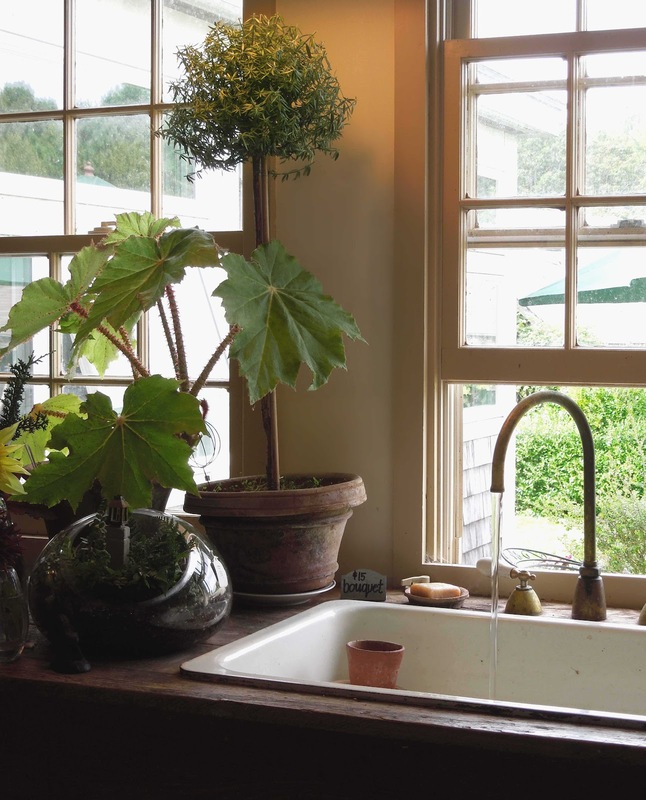 I think you were a model of restraint, those hand thrown pots and topiary plants are so beautiful. I think I would have bought a row of them. Dear 'Four Tops Loi' Snug Harbour looks like a lovely place to visit with lots of character and interest. The plants and topiaries really shine against the patina of the wooden tiles. 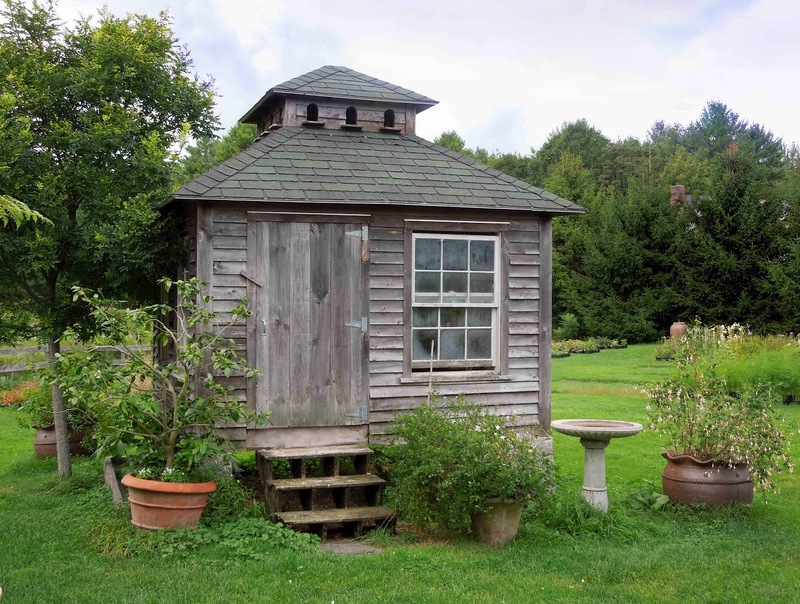 All the little outbuildings are lovely, I'd be poking my nose in everywhere to soak up the essence of the place. 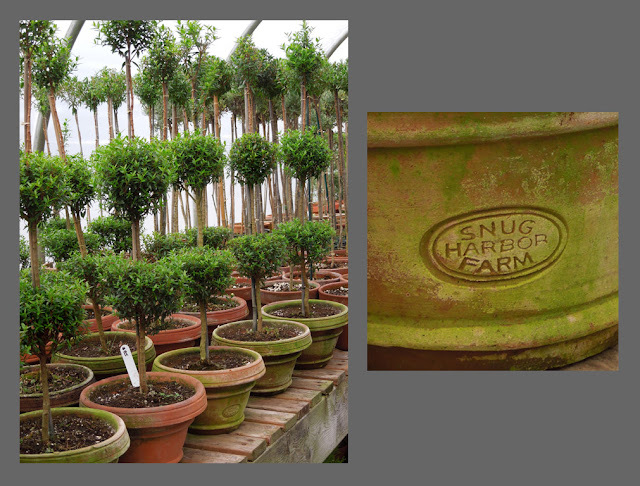 Thankfully more and more nurseries are realising that customers want more than just a simple stand of plants for sale. Hi Loi - I stopped at Snug Harbor Farm this summer too and it is amazing--the grounds, chickens, topiaries, outbuildings, etc. I was tempted to buy a lavender topiary but concerned about not having enough sunlight for it during the winter months. Which variety of topiaries did you buy? Oh, Loi, I would have a fun time here! so many beautiful plants and flowers, and the vegetables look amazing! Thank you for sharing. You find the greatest places. What an amazing farm. So many beautiful things to look at. I love the rustic sheds and barns. I'm on way to vote. This looks to be an absolutely wonderful nursery and exactly the kind of place we should enjoy immensely. We too are very keen on all manner of topiary and, in our gardening years in Herefordshire, used it a great deal both for interest and to enhance formality. 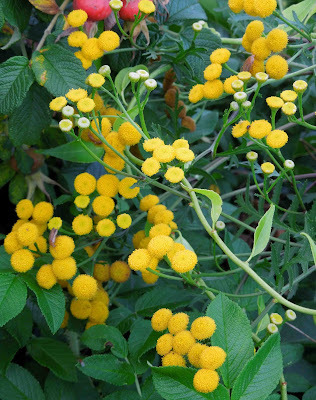 What is more, it is surprising the number of plants which will respond to shaping. We should have found it very difficult at Snug Harbor Farm to have come away empty handed!! The farm is enticing, Loi. I love the hand-thrown pots and hope they will offer them online. The hydrangea petiolaris-draped outbuilding flanked by Australian tree ferns is picture perfect. Thanks for the virtual visit from those of us too far away to visit in person. Absolutely gorgeous! This is my kinda place.. all the way down to all that organic fresh produce (great photograph!) I went to my local nursery Friday to look for a new cone shaped topiary for the iron urn in my front entry and came back with nothing. There are so many choices.. boxwood, ivy, ... do you have a preference for shaping?? Hi Loi, I have the same topiary pictures from Snug Harbour. What a gorgeous place. I love it there. I went last year with Steve from an Urban Cottage. Maine is one of many favorite states. Your images on your last post are gorgeous too. Hi Loi, I just voted. 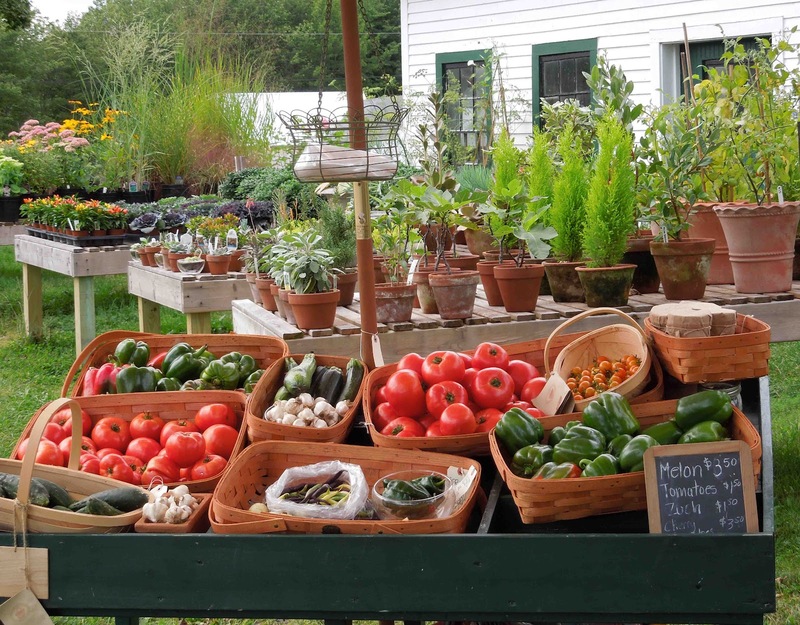 Snug Harbor Farm is a slice of Heaven on Earth. Thanks for the joy of the morning. you know i love words...so the sound of snug harbor just tickles my ears. love that. placing this destination on my list of places to see. i never tire of topiaries! What a charming place and definitely a plantsman's paradise, a heaven for every passionate gardener! Lovely old buildings, beautiful images! Hi Loi, what lovely photos and it looks like a charming spot! So glad you had a good day there and enjoyed yourself. You must have loved the topiary collection! Lovely place Loi! Love the dovecote and the outbuildings. I'm so envious of people who are great with plants and greenery...I should probably just break down and hire a gardener and move on:). We're back from France and back to the projects:) What a lovely time we had! Who doesn't love a topiary? I am always drawn to them. Hope to see pictures of the four your brought home. Looks like a fun visit, and I too could have spent hours roaming amongst the plants and flowers. I love that little dovecote. Every single photo is beautiful. I love the pink flower in the foreground with the building in the background. Really breathtaking, Loi! You should watermark your photography! Once again a wonderful post for us all! Love the topiary filled greenhouses filled with the magic of silently growing plants. Feast for all your senses including a photographers natural eye to capture and share..how grand of you Thanks! Old wood, overly cloudy skies, nature's bright flowers and plants in the hand thrown pots really make this a perfect spot for a picnic as well. Love it all Thank You! Oh Loi...I love this quaint nursery...and I'm on the topiary wagon too...spotted some out of my car window today that I have to go back and see about for my back porch. Have a great week...PS Wish you were coming for Sunday Supper, we would have such a good time. lLoi, this looks like a magical little place to while away the hours. I love all of these photos. I would love to have a topiary but honestly indoor plants and I do not have any luck. I think it is because I am too generous with the water. Going to vote for your friend. We were in Maine last week and so wish I had know about Snug Harbor Farm...definitely my kind of place - such beautiful images! What a fabulous place! I'm with you with the topiaries - I'm absolutely obsessed, although I'm now obsessing about that amazing dovecote, and scheming up ways of replicating it in my own garden. Your posts never cease to inspire Loi! Que fazenda linda, amo este estilo. Gosto de topiaria, tenho tentado fazer em casa,mas é muito dificil elas crescem rápido e perco o desenho. What a dreamy place to visit! Thank you for taking us along. I too could spend all day at such a wonderful nursery! You must show us where you've placed your four new topiary beauties! That looks like heaven! Thanks for sharing. Loi, Nice little field trip. I like the quaint feel of the farm. I now have topiary envy! Thanks for that :) On another note: I hope your lavender perks up! You are fortunate to live near so many beautiful sites. I loved the gardens and the topiary selection you've shown us. We have nurseries here that sell topiaries but I'm not sure I've seen the variety in the picture. Thanks for the tour! wonderful photos, the fantástic palce! Sigh... oh my... another fabulous post!! I swear, every picture you take is so dreamy!!! Thanks for making my morning once again! Hope all is well Loi!! Your photography, as always, is simply superb! That butterfly shot - WOW! I, too, adore topiaries....even tried to grow one from a coleus plant for my garden club. Oh my.....much harder than it would seem. These are glorious and I would have probably tried to bring home a truck load. Had a chance to go there two years ago and didn't go. Could shoot myself!! it's a pleasure to see this nice work. My roses are photographed in a garden. loi - this is beautiful, but your photography is incredible. i'm jealous!!!!! Charming indeed! And the topiaries are lovely...perfect in those hand thrown terra cotta pots. Una bella serie di fotografie, la natura ci regala sempre delle emozioni! What a delightful place, Loi. Wish I could get my hands on those topiaries in the terra cotta pots. Beautifully photographed as usual. Thanks for the tour once again, Loi! Loi, I love this area especially this time of year...thanks for being there for me and nudging my memories...loved the photos! You will be proud of my purple garden next year! Maine is full of treasures. 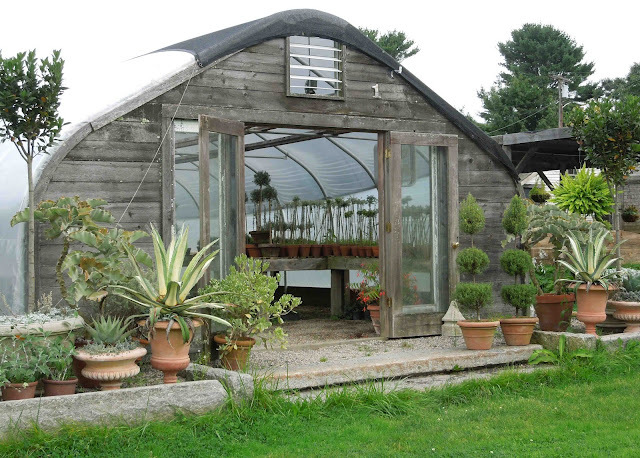 The image of the vine covered shed with potted palm could be the cover of a book! Gorgeous. It is a wonderful farm, I too can spend the whole day there. It is so nice of you to share your Maine visit with us. You must have been in HEAVEN walking around this place! what a place! And yes, every time I see a topiary I think of you! :) do they have a nice cafe?? Well just look at all of those beautiful topiaries waiting for me to kill :) Seriously you can take a hell of a picture my friend. Everyone of those were stunning...and that butterfly looked like I could pet it!